Drama camp at the Winnsboro Center for the Arts wound down with two performances of our show. We had SRO for both performances and everyone had a grand time. 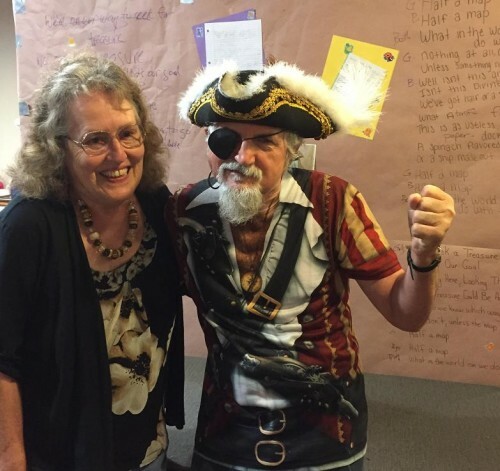 George Gagliardi, the singer/songwriter who helped the kids with the music, got into the pirate spirit. If you regularly read my blog, you know that I am an environmentalist and I do what I can to preserve the planet for future generations. There was a time when I was not aware of our carbon footprints and other ways we were damaging the intricate system of nature that keeps everything operating the way it should be. I think that is true for many people who are immersed in raising families, working at another job, and maybe sometimes even having some fun. (smile) With all of that going on, we don’t always stop and think about what we are doing to the earth and all the things that sustain it. In the face of this troubling situation, some major retailers and communities are starting to act. In addition to Lowes, Home Depot, BJ’s Wholesale, and Whole Foods are taking measures to remove these pesticides from their store shelves, and more than 20 states, communities, and organizations have already passed measures to limit or ban neonicotinoids.4 It’s time for Ace and True Value to stop contributing to the problem and join their competitors to immediately prevent any further damage to bee colonies. I do hope you will take a moment to sign the petition. It’s quick and painless, and your grandchildren will thank you. Please do leave a comment and let us know what you might be doing already to protect the earth. I know that a lot of people are more aware of the precarious eco-system and are finding ways to minimize their carbon footprints. And now that drama camp is over and my life will be getting back to something close to normal, I will get back to the regularly scheduled features here. Thanks for hanging with me.